Your walking tour begins in front of a coffee shop in the Brooklyn neighborhood of Bushwick, where you can grab a cup of joe to go, if you wish. Meet your art-enthusiast guide, and take off along the streets that practically pulsate with creative energy. 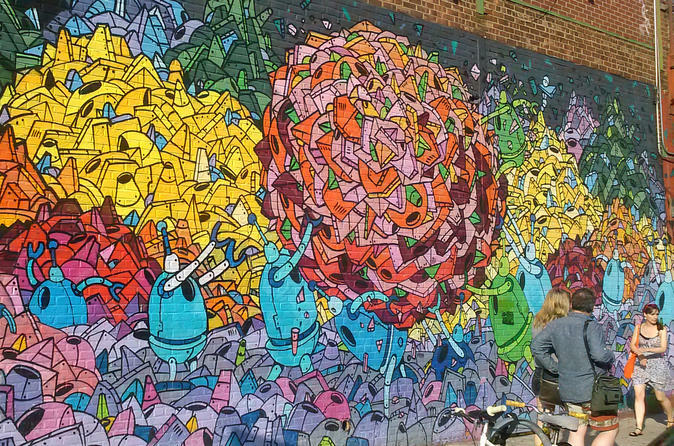 As you walk and check out some of Brooklyn's best murals, listen to your guide talk about the borough's growing art scene and the lifestyles of the urban artists who come from all over the world to put their mark on New York City. See murals that cover entire brick walls, as well as fun yet simple creations that decorate smaller objects like signs. From your guide, learn why this area’s graffiti culture is one of the best in the world, and hear about how people trade art, including murals, wheatpaste posters, tags and stencils. You'll discover different techniques, subtleties between each artist, and the evolving styles that bring this neighborhood to life. Hear about the quirky personalities of the top artists and how much dough people have shelled out for their finest work. By the time you end your tour on Bogart Street, you'll have a new appreciation for what you may once have thought of as just graffiti.